NOT so long ago agricultural conferences were dominated by speakers urging farmers to imagine what life would be like if they could monitor the health and needs of their crops in real time and deliver precision solutions. Thanks to drones, sensors, satellites and sophisticated algorithms, that futuristic scenario is not only possible but increasingly in use today. IBM scientists in the US recently used free public satellite images to help a Californian vineyard figure out where its water was going, allowing it to reduce its total water use by a massive 40 percent. 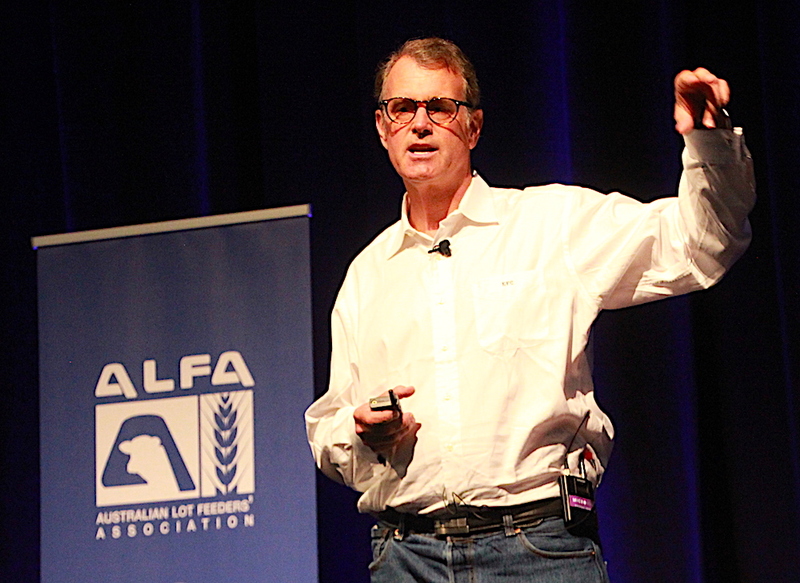 One of the scientists involved in that project, ‘internet of things’ expert Ted Connell, now a solution architect with Intel Corporation based in Phoenix, Arizona, spoke at last week’s Australian Lot Feeders’ Association BeefEx conference in Brisbane. 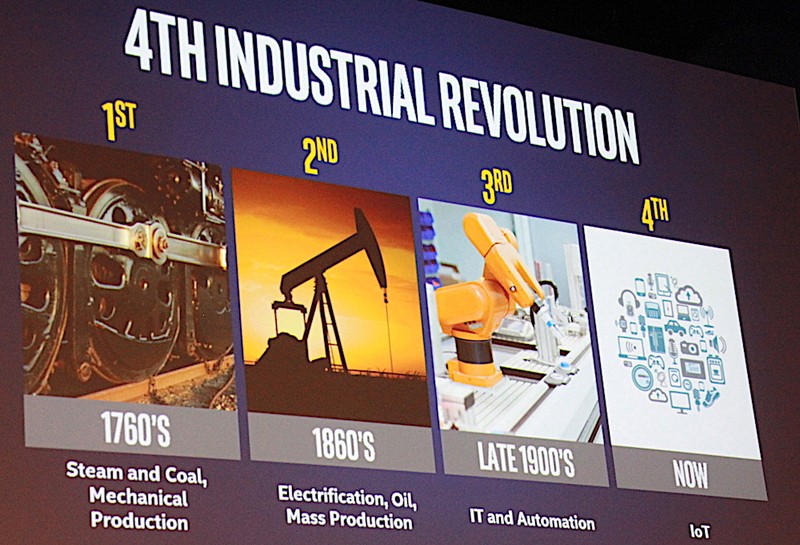 He offered several insights into how the “fourth industrial revolution” is set to change the future face of agriculture. 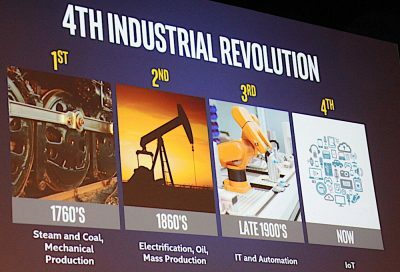 As demonstrated in this image to the right, the first industrial revolution was steam powered mechanisation, the second was electricity, the third involved computing, IT and automation, and the fourth – made possible by the dramatically decreasing cost of computer power, storage and networking and ‘zettabytes’ of data now available – is artificial intelligence and the Internet of Things. The media and Hollywood have used artificial intelligence to scare the wits of people for years, ie think the Terminator movies, but Mr Connell told the BeefEx conference that AI was nothing to be scared about: “It’s just math, and it is not taking over the world”. Computers were very good at doing mundane tasks to find answers and solve puzzles, and were now better at recognising voices or images than humans. By replacing the need for multiple contracts with multiple people with a single ledger visible to all, and without the need for verification by banks and/or governments, blockchain technology had the potential to become a very powerful tool in agriculture, he said. “If I don’t need a bank or a government to verify a transaction, I can have a much more efficient system with less friction. “I don’t need the bank, I don’t need the Government, you and I can do an agreement, everybody watches. Technology to create cultured or printed food could do to food production what Henry Ford did to the manufacturing process. It was becoming possible to take a culture from one cow and to scale it across billions of people. Mr Connell said the industry should not be thinking about this development as competition but as a market expansion. “There are billions of people, think of Bangladesh, think of China, think of India, who cannot afford meat protein,” he said. “If I could culture and print it and drop the cost by a couple of orders of magnitude, I could increase my market by billions of people. He urged the meat industry not to take the cultured meat industry lightly. Netflix has become one of the biggest companies in the world, but many of the companies it disrupted didn’t see the threat coming. “These new businesses (like Netflix) just came in and blew up old businesses that just were not looking at these guys as competition,” he said. “You guys are not looking at them (cultured or printed meat) as competition at all, you’re laughing at them, you’re mocking them.